Career opportunity of Banking Jobs in Pakistan Management Trainee Officers MTO Jobs in ABL Bank MTOs Jobs 2017. 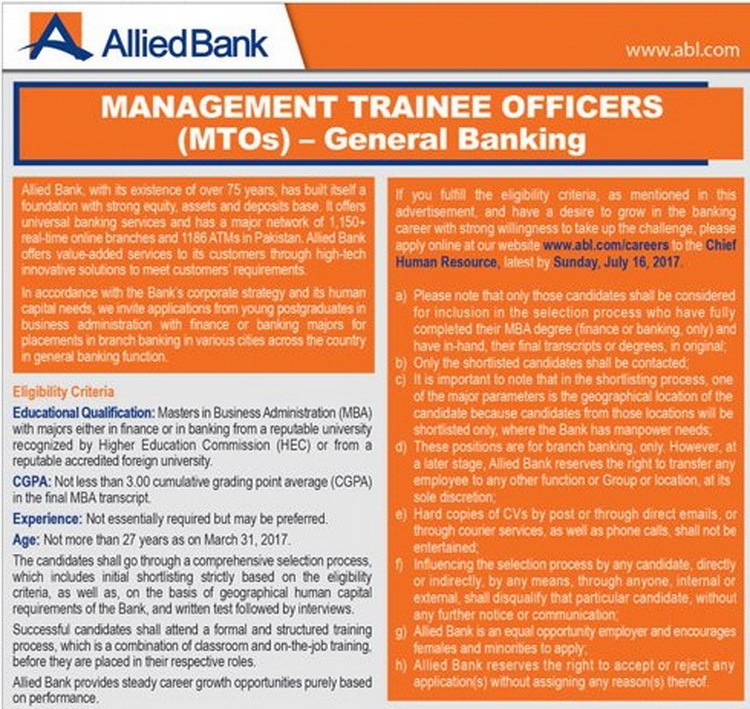 Candidates are required to visit ABL Jobs site to apply online on these ABL MTOs Jobs Management Trainee Officers Jobs in Allied Bank Pakistan. This Ad of MTOs Jobs in ABL is Published in Daily The Newspaper on Sunday 09-07-2017. MBA with Majors either in Banking or Finance. Age Should not more than 27 years as on 31-03-2017. Fresh candidates can apply but experience will be preferred.